The eco-friendly houses received the highest level for efficiency. 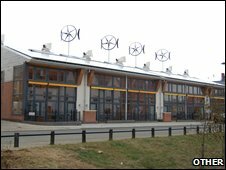 New eco-friendly houses built in Northamptonshire are believed to be the most energy efficient in the UK. The six houses in Upton have received Code 6* status from the Code for Sustainable Homes, which is the highest level for efficiency, and a UK first. The homes have been funded by The Homes and Communities Agency (HCA) and the Metropolitan Housing Partnership (MHP). Each home has had their design rated in nine categories including energy consumption and carbon emissions. The homes are carbon-neutral and have wind turbines on the roof to provide renewable energy. Housing Minister Margaret Beckett said: "The Code for Sustainable Homes is already helping house builders to cut carbon emissions from homes and from 2016 all new build homes will be zero carbon."